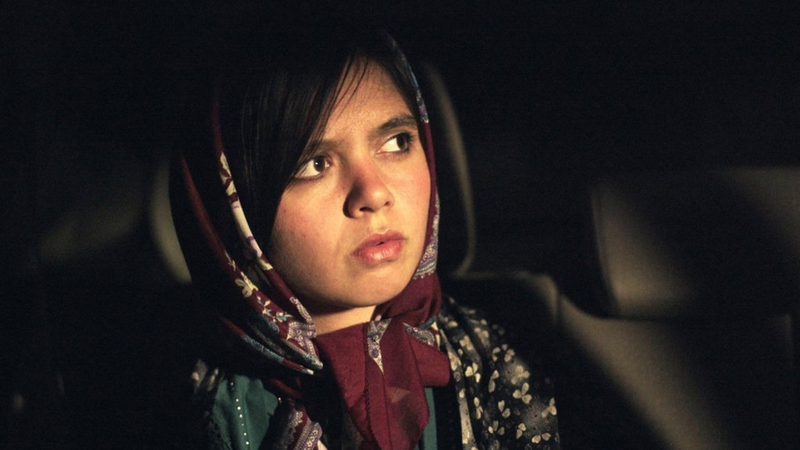 Being in the wrong place at the wrong time is the theme of Jafar Panahi’s 3 Faces, a Chekhovian portrait of lives going to waste in an Iranian society of gender inequality and rural tradition. A young woman speaks directly to her phone, delivering a message, a plea to be heard by a famous actress. The girl Marziyeh (Marziyeh Rezael) lives in a remote village in the mountains, she explains, and dreams of studying in the conservatory in Tehran and ultimately becoming an actress for the cinema. She has applied and been accepted at the school, but her parents are now welshing on a deal they made to persuade her into marriage. This has caused Marziyeh to resort to desperate measures which are now shockingly shown on the video message as a noose hoves into view. Behnaz Jafari – playing a version of herself – is the recipient of the message and has been so shocked that, unable to continue with her work, she has enlisted friend and director Jafar Panahi – also playing himself – to drive her to the remote village and serve as translator and detective to find out whether the girl genuinely did kill herself or if the whole thing is a fake. Extended car journeys take up quite a lot of time in Iranian cinema, from Abbas Kiarostami’s Taste of Cherry to Panahi’s own Taxi Tehran. It makes good practical sense for films with modest budgets to keep things moving, but there’s also something about a car journey that allows for private conversation the way the street or the semi-public family home doesn’t. Panahi and Jafari are both representative of what would be the cosmopolitan intellectual and artist elite if it weren’t for the Iranian Revolution. With the villagers, they literally don’t speak the same language: villagers prefer Turkish – which Panahi just about gets by with – to their Persian. Jafari has celebrity but her fame is double-edged. The villagers respond to the novelty of the TV star in their midst, at one point mobbing her for autographs, but are equally dismissive of “entertainers”. A local woman, who was an actress and dancer before the revolution, is spoken of as a hermit and outsider. She is a glimpsed presence, a lost generation, barely recalled by their once adoring fans. Likewise, when Panahi and Jafari reveal they are looking for Marziyeh, they are treated with increasing unfriendliness. Marziyeh is despised with such open hostility as “empty headed” that it becomes abundantly clear why she would want get to the big city. Panahi keeps everything as softly spoken as his own onscreen presence and yet some of those quiet observations are devastating. A system to get up the narrow winding mountain road where drivers beep to alert each other to their presence and whether or not they are in a hurry, a real hurry or an emergency is undercut when one woman reveals that she offered to work and widen the road so that two cars could pass. It was rejected out of hand because she was a woman and the system remains in place. The road is blocked; progress is slow, hampered by tradition and misogyny, but there are still voices that want to be heard and despite his own current house arrest, Jafar Panahi’s is one of the most articulate and convincing.